Are you a compulsive online shopper? Are you planning on buying some gifts off the Internet this holiday season? Want to know how you can make money back? I occasionally shop online for things that I can’t find here in my hometown or if I can get it at a cheaper price online. I’m very impatient so if it was between going to the store or ordering it online I would choose buying at a store hands down. That’s until I found out about Ebates. Basically what Ebates is is a website that is full of affiliate links to different sites but instead of the company keeping the affiliate dollars they credit your account and you get some of your money back. Sounds too good to be true right? Well, it isn’t! 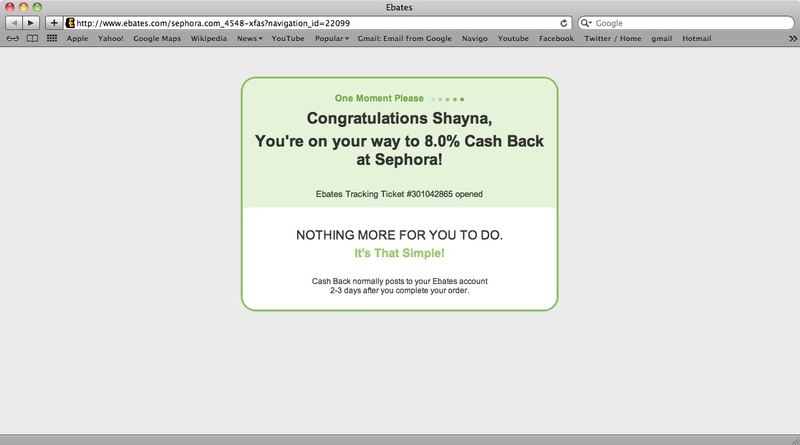 I’m not sure how Ebates makes money exactly (probably through advertising and partnerships), but it’s totally legit. And, no I’m not getting paid by Ebates or anything to say this. I found out about the site a couple of weeks ago and I already have over $15 coming my way. So what stores can you find on Ebates? Oh gosh, they have seriously everything. Anytime I shop online now I’m going to check out the list of stores Ebates offers because if I can get a percentage back from my purchase why wouldn’t I? It’s basically free money for shopping (well, kind of). The site has everything from Bath and Body Works, Nordstrom, Sephora (eight per cent back! ), Wal-Mart, iTunes, Groupon, you name it. So basically all my favourite stores. Each store has a different percentage back and they often have higher percentages on some stores depending on the time of year. 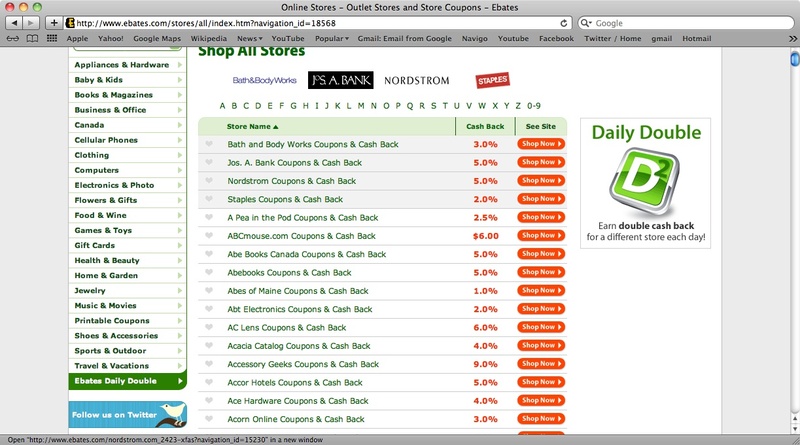 In addition to cash back links they also provide coupon codes for some websites as well. 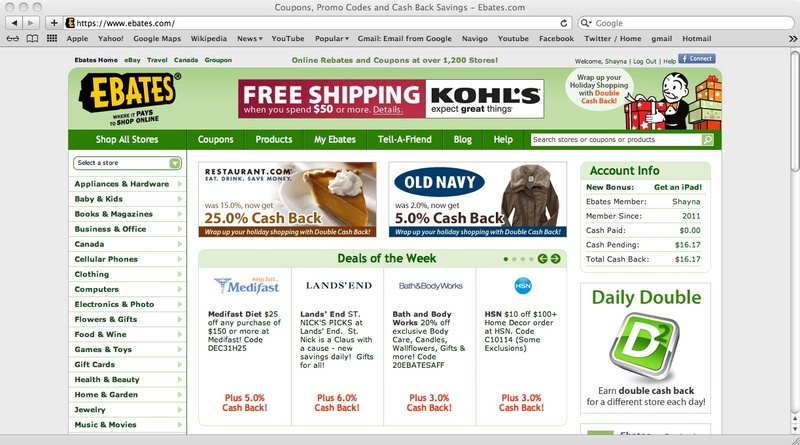 To make sure that Ebates credits your account you have to click the link through their website. So for example, when I clicked on the Sephora link Ebates takes me directly to the website and you just go through there. You have to make sure that you go through Ebates website first, if I went to Sephora.com directly I would not be credited. Also, if you leave the page and then come back I don’t think you would be credited either. If you leave, go back through Ebates. Finally, you also get a $5 bonus for signing up and making your first purchase. So when do you get your cheque? They mail them out every three months for the appropriate spending period. For example, for anything that you accumulate from January 1 to March 31 you would get your cheque near the end of May (they mail them out May 15). So why am I telling you about this? Well, a lot of people shop online during the holiday season (well, any season really), so why not get some cash back while you are doing it? It doesn’t cost anything to sign up so what do you have to lose? What more information about Ebates? Check them out online! Have you used Ebates? If so, what were your thoughts?